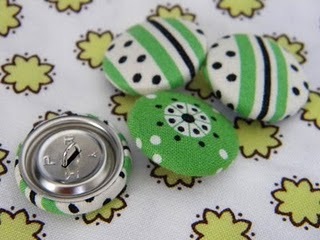 While flitting around, well okay...chasing the boys around, my favorite fabric store, I found button making kits. 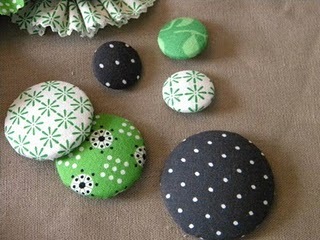 Yeah, make your own fabric covered buttons. Such a good idea, perfect for Auntie A's shower. I can make all kinds of things with these guys... magnets... necklaces... earrings...yay! Out of any fabric I choose! Double YAY! 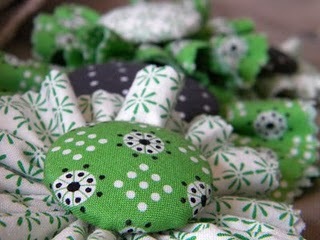 I gathered some strips of fabric and hotglued them to the back of the buttons - ta-da, instant flowers. I got so excited about it, I forgot to take pictures to show you how easy it is. So easy, so cute. Will do a tutorial this weekend.